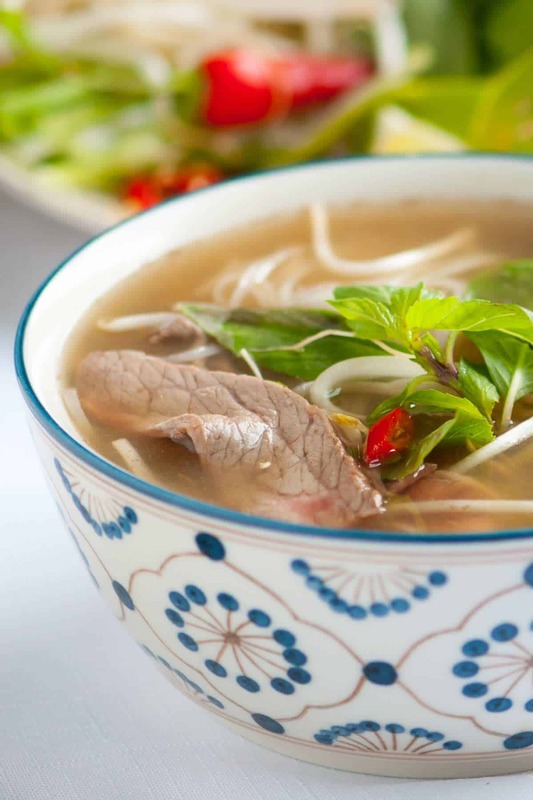 Making your own Vietnamese pho soup at home is not hard, all you need is a straightforward recipe, a few secrets and a nice big stockpot. 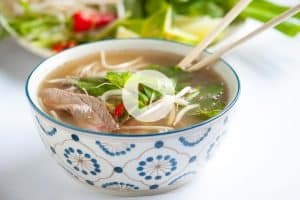 Jump to the full Homemade Vietnamese Pho Recipe or watch our quick recipe video showing you how we make it. If you’re sitting there and wondering “what is pho,” it’s a delicate (and delicious) Vietnamese noodle soup, made from beef bones, ginger, onions and lots of aromatic spices. It’s nothing short of soup perfection. The way all the spices and flavors from star anise, cardamom, fennel seeds and cinnamon come together is incredible and the best part? You can customize; it’s encouraged that you add any and all the condiments you desire to make it your own. We make this at least once a month, always making sure there is leftover broth to freeze for another day. While it takes a bit of time, most of that is hands-off, so let’s get going towards amazing pho at home, shall we? 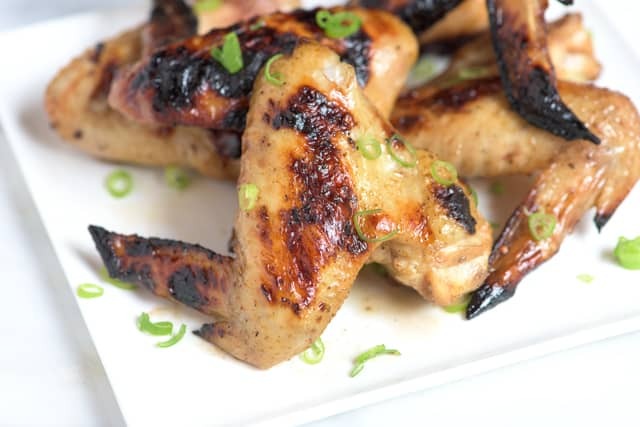 We love all the flavors of pho so much that we’ve even made Pho-Inspired Grilled Chicken Wings marinaded in ginger, garlic, lime and fish sauce. You can’t make an awesome soup without awesome beef bones, right? So, look for knuckle and leg bones that contain marrow. We buy beef knuckles from a local Asian market and find them to be pretty inexpensive. When you simmer bones they release “scum” or impurities. If you don’t get rid of this, you’ll be stuck with a cloudy broth. Not good. We like our soup to be as clear and clean as possible, so we add an extra step. Add the bones to a large stockpot, cover with cold water then bring to a boil. Boil for a few minutes then throw the water and bones into a strainer. Discard the water then rinse the bones to get rid of all the impurities. Also, make sure you give the pot a rinse, too — there will be scum on the bottom and sides of the pot. 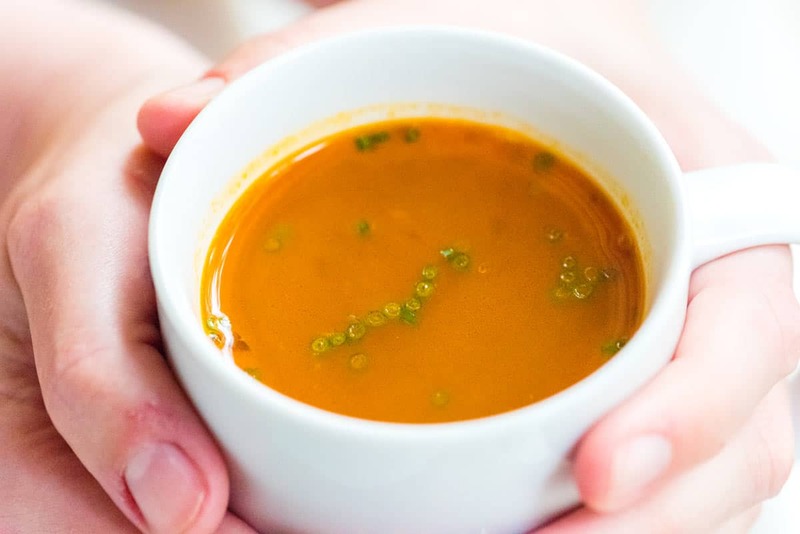 You May Also Like: Try our homemade vegetable broth which is hearty enough to enjoy alone as soup and works perfectly as a replacement to boxed stock in your favorite recipes. To create that distinctive and deep flavor of great Pho, slide onion and a sizable piece of ginger under the broiler. Broil until well charred. That’s going to give you nice depth and color. Even though we’re simmering the broth with spices for a few hours, we still like to give all the spices a quick toast before adding to the pot. 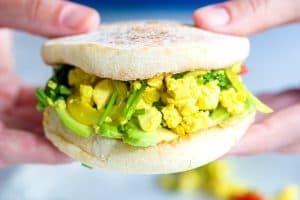 To do this, throw them into a dry pan over medium heat, stay close and shake the pan a couple of times to make sure they toast. You’ll know when they’re ready when you start to smell them. It only takes 2-3 minutes. Don’t just use regular white sugar from your pantry. We know that buying yellow rock sugar seems pretty particular and we’re all left with the problem of what to do with it after making this pho, but here’s the deal: using plan old sugar sadly produces a sweet, flat broth, whereas the rock sugar rounds things out and brings everything together. Plus, you’ll need that leftover rock sugar for the next time you make this recipe! Buy some. You really can’t make pho soup (or other Vietnamese recipes) without it. Our fish sauce sits within arm’s reach of our stove. We use it in everything and absolutely will not make pho without it. We’ve come to trust the Three Crabs brand of fish sauce, which you can buy online or in Asian markets. Update: We have recently given Red Boat Fish Sauce 40°N a try and we prefer it over other ones we have tasted. We really like the clean fish flavor it has over other brands. Andrea Nguyen of Viet World Kitchen suggests that when shopping for fish sauce, look for glass bottles, not plastic and allow price to guide you. Go for the mid-high priced fish sauce (which will run you $4 to $5). You can buy fresh noodles at Asian markets, which is a nice treat, but dried rice noodles work perfectly as well. Even if you use fresh or dried, never cook the noodles in the broth. If you do this, the broth will become cloudy. So, cook them in another pot (they only take a few minutes) and add the cooked noodles to your bowl just before adding hot broth. As for condiments, we’re partial to Thai basil (you can substitute regular basil if you need too), fresh mint, crispy bean sprouts, a teeny tiny splash of fish sauce and some Asian chili sauce. Some like to add hoisin sauce, but we rarely do — it can take over the delicate deep flavor of the broth. Oh, and while it’s not a “secret” make sure you have some freezer space to store some of that extra broth for the best make-ahead meal, ever! 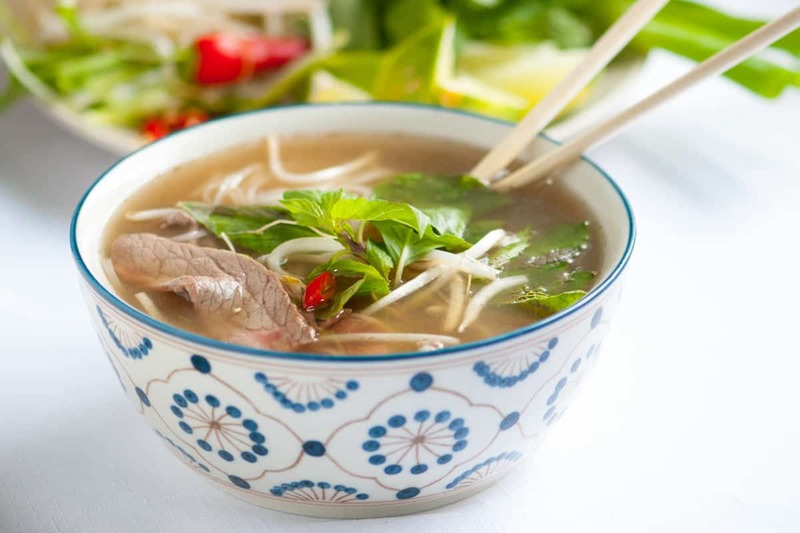 Making your own fabulous bowl of Vietnamese pho at home is not hard, all you need is a straightforward recipe, a few secrets and a nice big stockpot. We realize our recipe may look daunting, but this is quite simple to do and there is a lot of inactive time while you wait for the broth (we’ve just been extra tedious to share everything we know). Add beef bones to a large pot that will hold at least 10 quarts. Then, cover bones with cold water. Place pot onto high heat and bring to a boil. Boil for 3 to 5 minutes. During this time, impurities and foam (or scum) will be released and rise to the top. Drain bones, discarding the water. Then, rinse bones with warm water and scrub stockpot to remove any residue that has stuck to the sides. Add the bones back to the stockpot and cover with 6 quarts of cold water. Meanwhile, move an oven rack to a high position then turn broiler to high. Line a baking sheet with aluminum foil. 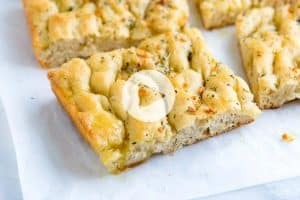 Place quartered onions and halved ginger onto baking sheet then broil for 10 to 15 minutes, turning onions and ginger occasionally so that they become charred or browned on all sides. 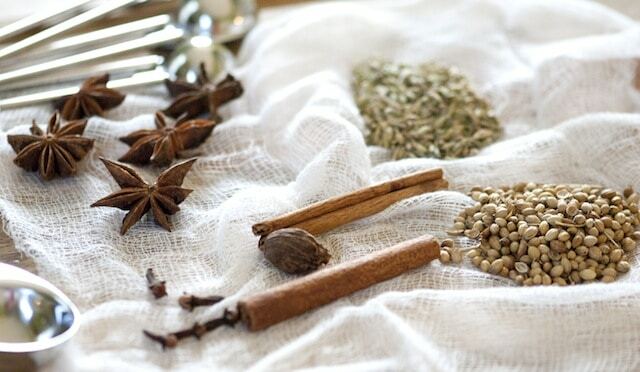 Add cinnamon sticks, coriander seeds, fennel seeds, star anise, cloves and the black cardamom pod to a dry frying pan. Place onto low heat and cook, stirring occasionally until fragrant. About 5 minutes. Place toasted spices into a cotton muslin bag/herb sachet or cheesecloth then tie with butchers twine to seal. Bring stockpot with parboiled bones and water to a boil then lower to a gentle simmer. Add charred onion and ginger as well as the bag or sachet of toasted spices. Add 1 1/2 tablespoons of salt, a 1/4 cup of fish sauce and the rock sugar. Continue to simmer broth, uncovered, for 3 hours. If at any time foam or scum rises to the surface, use a spoon to remove it. Use tongs or a wide mesh spoon to remove bones, onion and ginger from broth then strain broth through a fine mesh strainer. The broth will have a layer of fat at the the top. There are two ways to remove this. First, if you plan to enjoy the broth now, skim the fat from the top of the broth using a spoon. If you do not mind waiting, you can also pour broth into containers then refrigerate overnight. As the broth cools, the fat will solidify, making it very easy to remove. Bring the broth to a gentle simmer over medium heat. If you are using dried noodles, add noodles to a bowl then cover with hot water and soak for 15 to 20 minutes until soft and opaque. If you are using fresh, add to a colander then rinse with cold water. To cook the noodles, bring a medium saucepan filled with water to a boil. Place noodles into boiling water and cook for about 10 seconds or until they collapse. Drain noodles then divide between bowls. (We like to fill each bowl by 1/3 with noodles). Arrange slices of raw meat into bowls, and then top with the hot broth. Finish broth with onion slices and cilantro. Serve bowls with a plate of optional garnishes listed above. Black Cardamom Pod: Oddly enough, black cardamom is a member of the ginger family. It is quite powerful – providing a smoky aroma. 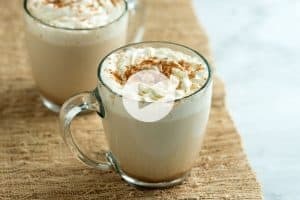 You can buy black cardamom at Asian markets, however, if you have difficulty finding it, you may leave it out of the recipe. Yellow Rock Sugar: This is also known as “lump sugar” and is sold at Asian markets. Look for it sold in a box. You will most likely need to break the rock sugar into smaller chunks. You can use a hammer or rolling pin to do this. Noodles: You can usually find fresh noodles at Asian markets. If you cannot, simply use dried “banh pho” noodles. Follow directions on package for cooking. For the fresh noodles, you will most likely need to immerse the noodles into boiling water for a few seconds. For dried, you will need to soak the noodles in hot water for 15 to 20 minutes or until softened and opaque. Check the package for specific directions. Raw Beef: Either ask your butcher to thinly slice the meat or if slicing at home, place beef into the freezer for 15 minutes to harden a little. Then, carefully thinly slice the beef across the grain into 1/16-inch thick slices. Onions: Raw onion can be overpowering. So, thinly slice the onions then submerge them in some water. Set aside for 15 to 20 minutes then drain and rinse. This will tone down the “raw” flavor of the onion. Recipe adapted and inspired by Andrea Nguyen of Viet World Kitchen and Jaden Hair of Steamy Kitchen. Nutrition facts: The nutrition facts provided below are estimates. We have used the USDA Supertracker recipe calculator to calculate approximate values. We did not include any table condiments (example: hoisin sauce).